No one wants losses. However, profit opportunities come with the risk of losing money. Though these risks cannot be eliminated, you can maximise income by properly accounting for losses while calculating your tax liability. Know the rules to ease your burden of losses. Income comes under five heads - salary, income from house property, income from business and profession, capital gain and income from other sources. The law allows you to set off losses in one against gains in another, depending upon the various criteria. First, loss from one source is set off against income from the same source. If the loss is still more than the profit, it can be adjusted against income from other streams. However, there are exceptions. A loss on a capital asset can be adjusted only against a capital gain. But losses from other sources can be adjusted against capital gains. 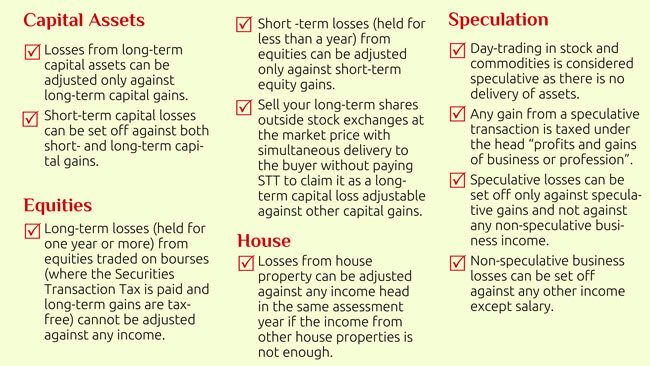 Any loss on sale of a long-term capital asset (such as house and gold held for three years) can be adjusted only against a long-term capital gain. A loss due to a shortterm capital asset can be adjusted against both long- and short-term capital gains. For such adjustments, the loss/gain can be from any capital asset other than shares. A loss from business or profession can be set off against all income heads other than salary while losses from a speculative activity or owning/maintaining race horses can be adjusted only against profits under the respective heads. If an income is tax-exempt, it cannot be adjusted against any loss from an income that is taxable. Casual income, such as from lottery, horse race and gambling, is fully taxable. "No loss or expense can be set off against income from lottery, crossword puzzle, gambling, etc," says Sudhir Kaushik, cofounder, TaxSpanner.com, a tax intermediary website. When a loss is more than the income against which it can be adjusted, the net loss is carried forward into the next year. "If the entire loss cannot be adjusted in one financial year, it can be carried forward for up to eight years," says Kaushik. Losses from speculative activity or owning/maintaining race horses can be carried forwarded for only up to four years. When a loss is set off in the year it is incurred, it is first adjusted against income from the same source, different sources under the same head or incomes from different heads. In contrast, a rolled over loss cannot be adjusted against income from a different head. Equity and equity-based mutual funds are considered long-term assets when held for at least a year. Though shares are a capital asset, a loss from equity can be adjusted only against income from equity. As equity trades on exchanges attract securities transaction tax (STT), long-term gains from stocks are tax-free. So, you cannot claim relief for any long-term capital loss. Short-term capital losses from equities (held for less than 12 months) can be adjusted against short-term gains from stocks. If you are losing money on an equity holding, you can put it to good use by selling within a year to book short-term capital loss. Even if you are sure about a future recovery, you can do this every year as hedge against a possible loss. Short-term capital gains from equities are taxed at 15%. Here is how it works. Let us say you buy 100 shares for Rs 1,000. If the price falls to Rs 500 just before a year of the purchase, you can sell the lot and buy an equal number of shares. This short-term loss of Rs 500 can be set off against any short-term gain from shares. Now, you have also made a new investment of Rs 500. In the second year, you sell these shares for Rs 1,500, which translates into a short-term gain of Rs 1,000. You have a total carry-forward short-term loss of Rs 500 if you haven't adjusted it. The effective short-term gain is Rs 500, on which you will have to pay 15% tax. If you had held on to the initial investment, the net gain would have been tax-free, but you would have also taken a higher risk. You can make a long-term equity loss eligible for deduction by transacting outside the exchanges at the existing market rate with simultaneous delivery to the buyer. "A long-term loss on listed equities where STT is paid cannot be adjusted because the income is exempt. If you sell the shares offline without paying STT, the loss can be adjusted against a long-term capital gain," says Kaushik. Losing money on house property shouldn't bother you much. All houses, let out or not, have an annual value, which is the higher of the actual rent received or the standard rent under the Rent Control Act (in the absence of standard rent, the highest of the actual rent, the fair market rent and municipal value) for taxation purposes. To arrive at a house's net annual value, first municipal taxes are deducted. Then, 30% rental income is deducted for maintenance and other expenses. Houses bought or constructed on borrowed money are eligible for deduction of loan interest from the net annual value while calculating the income from house property. Any loss in such a case has to be first adjusted against income from other house properties. If the net result is still negative, the remaining has to be adjusted against any other head in the same assessment year. If the entire loss cannot be adjusted, it can be carried forward for eight years, but adjusted against only income from house property. You can incur losses in business or due to speculation. Business losses cannot be set off against salary, leaving the rest income heads open. However, salary from a business partnership is treated as 'profits and gains of business and profession' and can be adjusted against a loss in business. Business losses can be carried forward and set off in the subsequent years even if the business has been discontinued. Losses from specified businesses that are allowed investment-linked deduction under Section 35AD of the Income Tax Act can be set off against gains from only the specified businesses. Certain businesses, such as intra-day trading in shares and commodities, are speculative. Losses from speculative businesses can be adjusted against only speculative profits. However, one can adjust nonspeculative losses against gains from speculative businesses. "Intra-day trading is considered speculative as there is no delivery of the asset. If it can be proved that the transaction was a normal business transaction, income from it can be treated as a non-speculative business income or a short-term capital gain," says Kaushik. As an exception, trade in derivatives (futures and options of stocks, currencies and commodities) is treated as non-speculative. If you want to adjust your losses against future income, it is important to file your return within the stipulated time. Losses under the heads 'capital gains' and 'profits or gains of business or profession' cannot be carried forward if you miss the return-filing deadline.